This is the health guarantee that you will receive with your puppy. 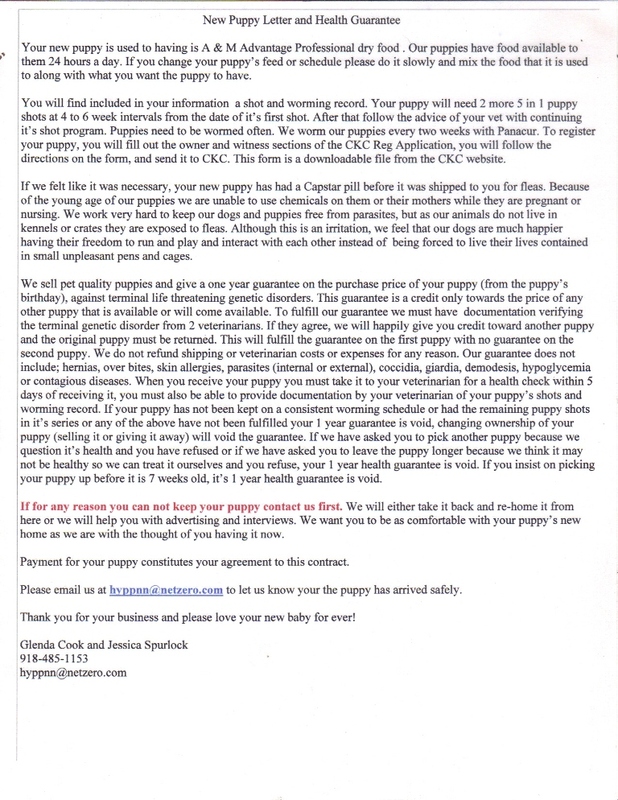 Before your puppy ships or can be picked up we must have a copy of this purchase agreement/guarantee with your dated signature. Your puppy will not leave our property without it. For the health of our puppies, the soonest they can be picked up is 7 weeks old. We start shipping the litters after they turn 8 weeks old. If you insist on picking your puppy up before it is 7 weeks old the health guarantee is void. If you have bought or reserved a puppy from us and while it is still with us if we have a uneasy feeling about a litter or puppy, instead of sending the puppy home with you or shipping it, we will contact you and suggest you pick another puppy. The litter may have gotten loose stool, we may be treating them and their mother with antibiotics, they may not be eating as aggressively as we think they should or they may be a really fussy litter of puppies. What ever the reason, if this happens and you refuse to pick a different puppy you will be taking your fist pick puppy at your own risk without a health guarantee. If we make this suggestion to you it is because we are trying to protect you and your family from being disappointed, not because we want your puppy for ourselves. If you are coming to our home to pick up your puppy and you still owe a balance on the puppy, we will no longer accept any payment other than cash for any unpaid balance on your puppy at the time that you are picking it up at our home. We still accept credit and debit cards over the phone for any puppies that are being shipped or paid for in full at the time that you pick it out. Because we have recently been the victims of a scam we are forced to require a signed and dated guarantee. Before your puppy ships to you or leaves our property if you are picking it up, we must have a signed dated copy of our guarantee in our possession, with the original signature of the person whose name is on the credit card that pays for the puppy. We will not ship any puppy if we have not received a signed and dated copy of the Health Guarantee.